Abstract: The members of the USB-IF (USB Implementers Forum) were not about to let USB die, so they came up with the USB 2.0 standard. There is always room for more bandwidth; be it CPU bandwidth, memory bandwidth or yes, even USB bandwidth. When USB1.1 was first released it eclipsed parallel and serial ports with transfer speeds of 11Mb/s and now USB2.0 is on the sceen with transfer rates of 480Mb/s! While IEEE 1394 Firewire has already gained a lot momentum in the digital video world, it has not posed much of a threat to USB in the trenches of day to day peripheral management. On the high end of bandwidth intensive products, USB's dominance has been severely threatened since IEEE1394 offers approximately 40x more bandwidth at 400 Mb/s. The members of the USB-IF (USB Implementers Forum) were not about to let USB die, so they came up with the USB 2.0 standard, which up's the ante to a bandwidth of 480 Mb/s over the same four wire cable. To meet the growing demand for USB2.0 compatibility Belkin have introduced a five port (four on the outside, one internal) PCI card with a nice blue PCB. Personally speaking, I really like the red LED's at each port which remain lit when the card is powered on. 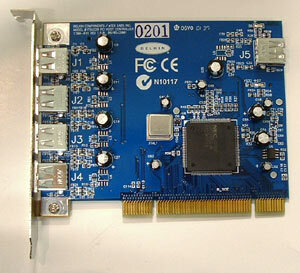 The Belkin USB 2.0 Hi-Speed PCI card uses the NEC D720100AGM chipset which is the same as those found on most of the USB2.0 supporting motherboards at this time. This way, users can update older systems by simply dropping in the USB2.0 PCI card. The card retails for around $75 CDN, and considering most Firewire cards come with just two to three ports for ~$100 this is a pretty good deal. While USB 2.0 based peripherals have been relatively slow to take off, devices that take advantage of the USB 2.0 are starting to pop up everywhere from USB 2.0 harddrives to CD-RW's to networking products. Does USB 2.0 really offer that much performance boost over USB 1.1? Well to find out we attached a 40GB 7200 RPM Samsung HDD to our USB 2.0 Media Bay and ran a few HDD tests... Let's see the benchmarks! While no where close to the actual internal HDD scores, USB 2.0 scores significantly higher then the older USB 1.1 standard could with the same drive. A limiting factor here might be the IDE ribbon in the USB 2.0 Media Bay. It's just a regular Ultra/33 IDE cable. We created two 512MB dummy files and used Windows Explorer to drag and drop the two files from the internal HDD to the drive being tested be it internal or external. The IDE controller and HDD both ran at Ultra/100 with DMA enabled. It's quite surprising here that the hard drive connected via USB 2.0 outperforms the internal HDD in terms of data transfer. Not just by a little, but by a whole 25 seconds! When you consider large data transfers that time adds up a lot. The performance of the Belkin USB 2.0 Hi-Speed PCI card is very good as you might expect from standard with supports data transfers of around 480Mb/s. When it is teamed up with an external USB 2.0 hard drive USB2.0 displays some very impressive performance characteristics which may ultimately give Firewire a run for its money. With USB 2.0, external hard drives, CDRom's or even burners are now a viable alternative to consider. For users looking to get on the USB2.0 bandwagon, and don't wish to replace an aging but still useful motherboard, an expansion card like the Belkin USB2.0 adaptor is a must have. With a sticker price of about $75 CDN price tag the card is not too expensive for a new technology, and as USB2.0 becomes more mainstream it will undoubtedly drop in price. Overall, if you're interested in adding USB 2.0 to your computer or need one for a specific application, you won't be disappointed with the Belkin USB 2.0 Hi-Speed PCI card!